YEREVAN (RFE/RL)—A newly built second highway connecting Armenia to Artsakh was inaugurated in the presence of President Serge Sarkisian and other senior officials on Sept. 1. 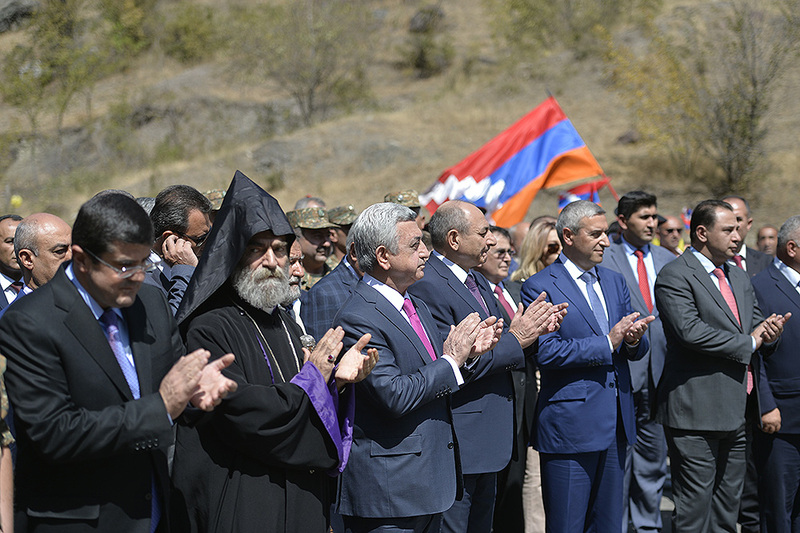 A newly built second highway connecting Armenia to Artsakh was inaugurated in the presence of President Serge Sarkisian and other senior officials on Sept. 1. Work on the 71-mile-long road began in 2011 and was essentially completed months before the inauguration ceremony, costing 17 billion drams ($35.5 million USD) in funding. The Armenian and Artsakh governments footed 56 percent of the bill. The rest of the sum was raised by the Hayastan All-Armenian Fund in annual telethons broadcast from Los Angeles in 2013 and 2014. In a statement on the ceremony, the pan-Armenian charity headquartered in Yerevan noted the “strategic significance” of the project. Passenger and cargo traffic between Armenia and Artsakh has until now been mainly carried out through a highway passing through Lachin, one of the seven districts in Azerbaijan proper that were partly or fully occupied by Artsakh’s Armenian forces during the 1991-1994 war. The Lachin road stretches for more than 50 miles from the Artsakh capital Stepanakert to the southeastern Armenian town of Goris. It was built in 1997 with the financial assistance of the Armenian Diaspora and the late U.S.-Armenian billionaire Kirk Kerkorian in particular. The second highway runs from the northern Artsakh town of Martakert to Vartenis in eastern Armenia through the Kelbajar district that has been under Artsakh Armenian control since 1993. Officials say that the new highway will not only shorten travel time between Yerevan and northern Artsakh but also stimulate economic activity in nearby rural communities and bring more tourists to the Armenian-populated territory. In particular, it will significantly facilitate visitors’ access to two medieval Armenian monasteries located in the area. The Vartenis-Martakert road should also benefit an Armenian company mining gold and copper in northern Artsakh. It is Artsakh’s single largest corporate employer and taxpayer.